Blue Nights opens on July 26, 2010, as Didion thinks back to Quintana’s wedding in New York seven years before. Today would be her wedding anniversary. This fact triggers vivid snapshots of Quintana’s childhood—in Malibu, in Brentwood, at school in Holmby Hills. Reflecting on her daughter but also on her role as a parent, Didion asks the candid questions any parent might about how she feels she failed either because cues were not taken or perhaps displaced. “How could I have missed what was clearly there to be seen?” Finally, perhaps we all remain unknown to each other. Seamlessly woven in are incidents Didion sees as underscoring her own age, something she finds hard to acknowledge, much less accept. Joan Didion was born in Sacramento, California, and now lives in New York City. She is the author of five novels and eight previous books of nonfiction. Her collected nonfiction, "We Tell Ourselves Stories in Order to Live, "was published by Everyman's Library in 2006. "The marvel of Blue Nights is that its 76-year-old, matchstick-frail author has found the strength to articulate her deepest fears—which are fears we can all relate to." 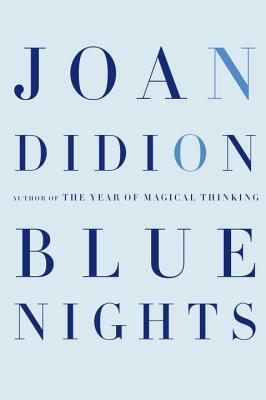 "Brilliant...Nothing Didion has written since Play It As It Lays seems to me as right and true as Blue Nights. Nothing she has written seems as purposeful and urgent to be told." "A searing, incisive look at grief and loss by one of the most celebrated memoirists of our time."